Home›Latest News›Apprentices›Calling local plumbing apprentices: are you tired of doing it tough? Calling local plumbing apprentices: are you tired of doing it tough? Rheem Australia is again helping 10 worthy apprentices by providing $30,000 in total grants as part of the 2019 Rheem Apprentice Plumber Grants program. It’s well known that apprentices can find it hard to make ends meet financially, and the impact the Rheem Apprentice Plumber Grants can have is immeasurable. 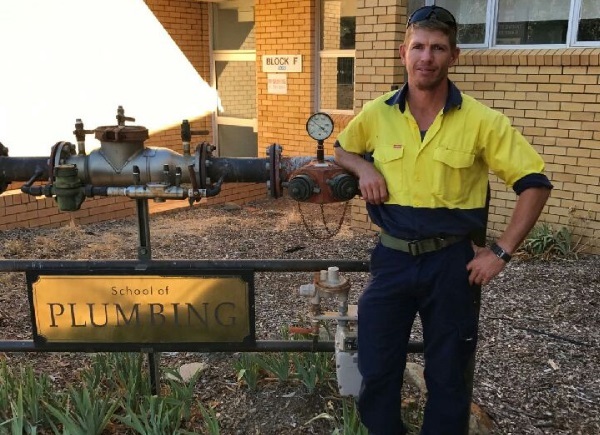 Canberra plumber Chris Osbourne, a 2018 Grants recipient, says, “I was truly overwhelmed when [Rheem] informed me I had won one of the grants. I was filled with both a sense of happiness and gratitude I find hard to express. The difference the grant will and has made has been phenomenal. Christopher Osbourne – Rheem Apprentice Plumber Grant recipient 2018. Rheem’s Chief Operating Officer Chris Taylor says that feedback from previous grant applicants, apprentices, plumbing teachers and employers has been that apprentices are finding it incredibly challenging to afford the fees, text books and tools – stopping many from finishing their apprenticeship. Each recipient of the Rheem Apprentice Plumber Grants will receive $2,000 to go towards TAFE/RTO fees and text books, plus a $1,000 tool voucher. Since the Grants program was launched in 2012, Rheem has awarded more than $200,000 in Grants to 179 apprentice plumbers from around Australia. “We really want to encourage applicants from all walks of life and ages. In the past we’ve had recipients from different backgrounds – from single parents, servicemen, farmers to a former school teacher. They all share a single goal: to become part of the next generation of plumbers,” adds Taylor. Applications for the 2019 Rheem Apprentice Plumber Grants close on Monday April 1, 2019. Apprentices can nominate themselves or their employer can nominate them on their behalf. Application forms are available at www.rheem.com.au/apprentice and can submitted by email, post or fax. Visit Facebook: @rheemaustralia or the Rheem website for further information and updates.